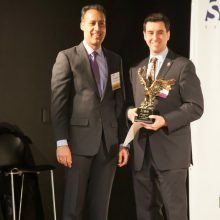 WashingtonExec presented Thomas Jefferson High School for Science and Technology (TJHSST) principal Dr. Evan Glazer with an honorary “STEM Champion” award at the 2015 K-12 STEM Symposium for his continued efforts in promoting STEM activities across Northern Virginia. Glazer served as a co-keynote speaker at the event. In a speech entitled, “The Tiger, Dolphin, and Jellyfish Parent – Which One is Best for STEM?”, Glazer discussed the extent to which parents should encourage their student to participate in STEM-related programs as they get older. He also educated parents on different perspectives of how to engage their students in STEM-related activities in a way that will work for their families. Click here to watch Dr. Glazer’s speech in its entirety.